High quality commercial grade 12V/1A (1000mA) AC/DC adapter with 5.5 x 2.1 mm Female Center positive plug. Easy connect and simple to use. UL listed, Certified adapter with high quality, Extra Long cable 10ft(3m) and 12 months warranty. Universal US plug adapter can be used with any appropriate device like Wireless Router, HUB, Switches, Security Cameras, Audio/Video Power Supply, Led Strip, Led string lights, ADSL Cats. Please confirm the plug size and voltage before purchase. If you’re not sure what to choose please ask us a question. Our friendly and effective service will put your worries aside. UL approved, Lead Free & RoHS compliant power supply. 1X 100V- 240V AC To DC 12V 1A (1000mA) Power Adapter Supply. Please check the plug size and voltage before purchase. Tips: voltage must equal to devise requirement, amp rating must equal or greater than requirement. This unit MAX power output is DC 12V, 1A(1000mA). Before you order please make sure your device input using DC 12V, 1A (1000mA). 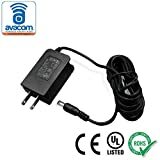 This entry was posted in Discount Computers and tagged 10Ft, 12V/1A, 2.1mm, 5.5mm, AC/DC, Adapter, AVACOM, Connector, Cord, LISTED, Power, Supply by Gadgets Manual. Bookmark the permalink.